MTU Maintenance, one of the world’s leading provider of MRO services for commercial aircraft engines and industrial gas turbines, has laid the foundation stone for a new logistics center at its Ludwigsfelde location on July 20. The total investment for the new building with a workspace of 6,500 m² is €11.5 million. The additional floor space is needed to cater to the location’s continued growth. Between 2016 and 2018, the number of operating hours has risen 30% and is expected to increase further in the two-digit percentage range in the years to come, the reasons being higher work-loads and the addition of new engine models to the company’s portfolio. Plans are to have the logistics center up and running in June 2019. AFI KLM E&M and China Eastern Airlines have signed a component support contract for the Chinese company's Boeing 787-9 fleet, which will eventually include 15 aircraft. The agreement covers repair services, access to a regional spare parts pool as well as the provision of a local parts stock, and additional services in the field of training and industrial development support. AFI KLM E&M has designed a competitive and tailor-made offer to convince the Chinese company, which was looking for an MRO service provider capable of providing excellent component support, combining expertise, availability and quality. With its "airline-MRO" profile, backed by both airlines KLM and Air France flying the 787, AFI KLM E&M has developed a unique experience on this product regarding both maintenance and operations. In total, AFI KLM E&M has already contracted sixteen airlines around the world. This A380 is able to operate worldwide and is powered by Rolls Royce Trent 900 model engines, with 471 seats distributed between three classes. The main deck has the First class for 12 passengers and Economy class for 311 passengers while the upper deck has Business and Economy class seats carrying 60 and 88 passengers respectively. The Trent 7000 is the fourth Rolls-Royce engine to receive formal certification in just 12 months, following in the footsteps of the Trent 1000 TEN, Trent XWB-97, and Pearl 15. The certificate was presented to Rolls-Royce by Trevor Woods, Certification Director, EASA, at Farnborough International Airshow. The Trent 7000, the latest member of the successful Rolls-Royce Trent engine family, is the exclusive powerplant for the A330neo which enters service later this year. The aircraft has been a star attraction at this year’s Farnborough Airshow, where it is made its first appearance. The Gulfstream G500 received both its type certification and production certificate from the U.S. Federal Aviation Administration (FAA). These certifications pave the way for the first completed G500 delivery to a customer as planned later this year. Bombardier Commercial Aircraft announced today that it has signed a firm order for four new CRJ900 regional jets with Uganda National Airlines Company. Based on the list price for the CRJ900 aircraft, the firm order is valued at approximately US$190 million. During the second quarter of 2018, Embraer has delivered 28 jets to the commercial aviation market and 20 business jets, being 15 light jets and 5 large jets. 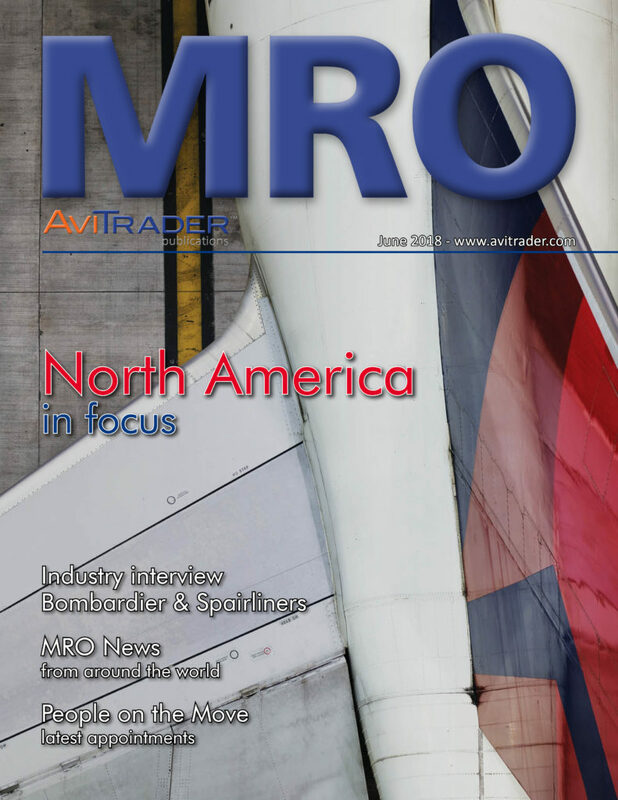 On June 30, Embraer’s firm order backlog totaled US$17.4 billion. In 2Q18, Embraer celebrated a major milestone when Norway’s Widerøe took delivery of the first production E190-E2 in early April in a ceremony at Embraer’s facility in São José dos Campos, Brazil. Scandinavia’s largest regional airline started its scheduled passenger service with the aircraft a few weeks later. Regarding the commercial aviation market, Air Costa’s order for 50 E-Jets E2 is no longer considered in Embraer’s backlog as of the end of 2Q18. This backlog adjustment has no impact on the E2’s production or delivery schedule for 2018 or for 2019. In the business jets segment, the Company unveiled during the 18th European Business Aviation Convention and Exhibition (EBACE) in Geneva, Switzerland, a new purchase agreement with Air Hamburg for four more Legacy 650E business jets. With this additional order, the Germany-based business charter operator will expand its Embraer flagship fleet to 17 aircraft. Air Hamburg is the world’s largest operator of the Legacy 600/650 aircraft models. The second quarter also marked the beginning of new Phenom 300E deliveries. Cusco Aviation, an Aircraft Leasing and Trading company based in the San Francisco Bay Area, has successfully completed the purchase of one RB211-535 engine. Manuel E. Cordero, the company's President and CEO commented on this transaction "The Cusco Aviation team is proud to complete another Engine transaction, which adds to its expansion plans and transaction portfolio growth during the first half of 2018." The agreement deepens the existing codeshare partnership between the carriers and follows the signing of a memorandum of understanding in December 2017 announcing the intention to form a joint venture. The joint venture will provide substantial reach into Canada and the U.S. with transborder service to more than 30 cities covering over 95% of U.S.-Canada demand, providing customers of both airlines with more travel choices than ever before. The new JV will also enable Delta and WestJet to compete more effectively against other carriers. Upon receipt of regulatory approvals in Canada and the U.S., Delta and WestJet will work together to implement all aspects of the enhanced cooperation including expanded codesharing, more closely aligned frequent flyer program and reciprocal elite benefits, joint growth across their U.S./Canada transborder network, and co-location at key hubs with more seamless passenger and baggage transit. The agreement will also include the ability to cooperate on cargo accompanying passenger flights as well as corporate contracts. This year’s Farnborough International Airshow proved a major success for MTU Aero Engines. Germany’s leading engine manufacturer secured orders worth around €800 million (according to list price), in particular with orders and memorandums of understanding (MoUs) for the PW1000G- geared turbofan (GTF) engine family for single-aisle aircraft. It powers the Airbus aircraft A220 (formerly C Series) and the A320neo as well as Embraer E2 jets, amongst others. “GTF programs are shaping MTU’s future in the commercial engine business,” commented MTU CEO Reiner Winkler, referring to the order books. 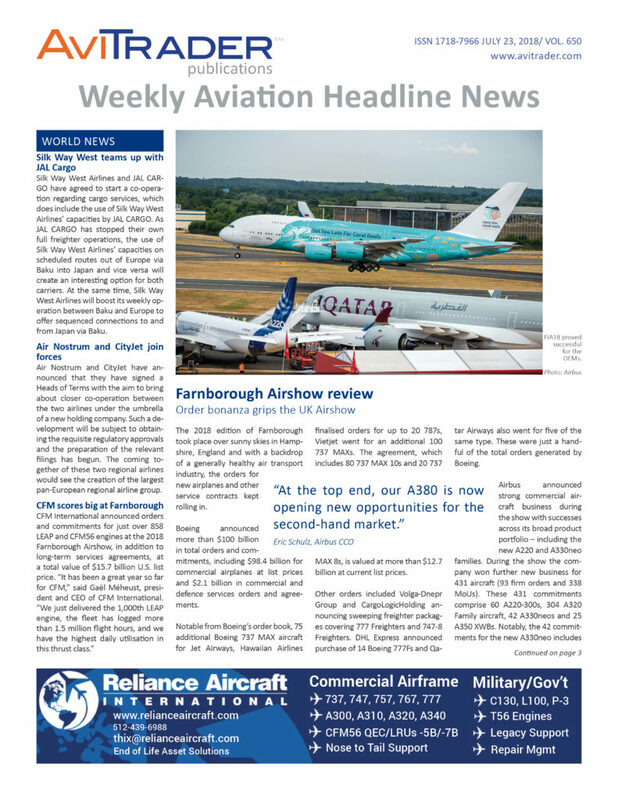 “The success of the geared turbofan family became evident once more at the Farnborough Airshow. PW1000G engines have been very well received in the market. Thanks to our preparation in recent years, we are ready for the ramp-up,” Winkler added.